Even though the name of this book is the Classical Vegetarian Cookbook, it is really a vegan guide for professional chefs and inspired cooks, a point the author Ron Pickarski emphasizes in this helpful guide to plant based cuisine. Two of the major points that chef Ron makes in Classical Vegetarian Cookbook is that: he has provided relatively easy ways of converting the classical sauces into vegan so that the recipe has the classical taste and mouth feel; and providing proper center plate vegan proteins for good taste and health. Ron has made it easy and healthful to eat wonderful classical restaurant meals every day at home or away, and encourages all professional chefs to learn the basics of converting almost any menu item into a vegan delight. Classical Vegetarian Cookbook is laid out as a teaching guide to explain all aspects of preparing vegan meals, and is filled with hundreds of recipe suggestions to help every chef and cook in preparing vegan cuisine. 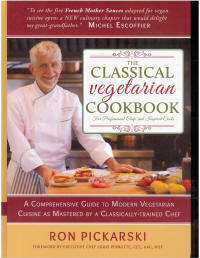 We recommend Classical Vegetarian Cookbook for every chef and cook, and as a library reference guide. Ron became a progressive chef in the art of translating Classical French and Modern Cuisine into vegan or vegetarian cuisine using plant-based natural and/or organic ingredients. His premise is that Vegetarianism is a cuisine. In 1978, Chef Ron decided that the world stage of the International Culinary Olympics (IKA) would be a viable event to give vegetarian cuisine a contemporary and upscale image. From 1980 to 1996, he led his American Natural Foods team to win seven medals (gold, silver, and bronze) using only vegan plant-based foods and was the first chef in the history of that prestigious event to do so. 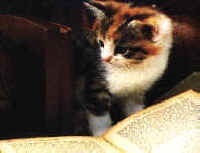 Chef Ron has made numerous television appearances, written three cookbooks, in addition to the Classical Vegetarian Cookbook, and many articles for national periodicals. He has been featured in Vegetarian Times, Art Culinaire, The National Culinary Review, USA Today Weekend, Boston Globe, Miami Herald, Chicago Sun Times, Los Angeles Times, etc.